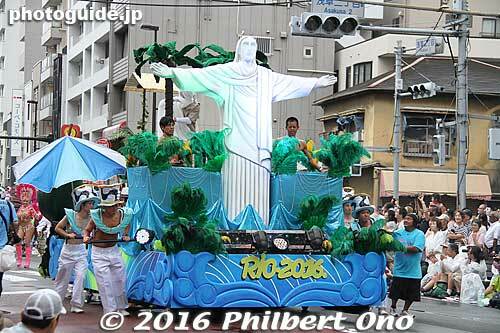 With the Rio Olympics in 2016, I thought seeing Asakusa Samba this year was a good idea. It was a cool day as well, not the usual summer heat. It did rain a bit, but I’ll take the cool over a hot summer sun any day. Photos shot on Aug. 27, 2016, 1 pm to 6 pm in Asakusa, Tokyo, Japan. Horse-themed Robot Restaurant girls at Asakusa Samba 2016. Yuka-chan, A.B.S.UNIDOS DO URBANA based in Nagoya. Onsen (hot spring) themed float. She’s definitely some kind of athlete. More Asakusa Samba 2016 photos here.